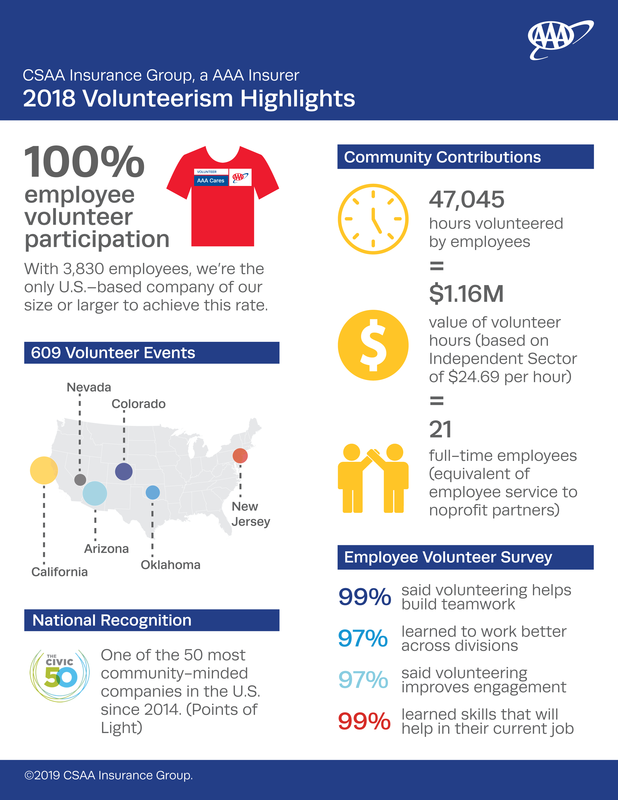 Through AAA Volunteers, the company’s national award-winning corporate volunteer program, 100 percent of CSAA Insurance Group employees volunteered last year – the highest large company volunteer participation rate in the country. CSAA Insurance Group engages 3,800 employees in volunteer service, and we provide each employee with 24 hours of paid time off to volunteer. Recognizing that every company employee can be a powerful agent of positive change, we offer a range of community service activities that can significantly increase the impact an individual donor and volunteer. Each year, we promote over 600 company-supported projects with nonprofit organizations including the American Heart Association, Habitat for Humanity, Junior Achievement, Stop Hunger Now, and The Crayon Initiative. Employees may also participate in multi-day outings to the Grand Canyon, as well as Zion and Yosemite National Parks. In fact, CSAA Insurance Group has received numerous volunteer awards and accolades from the National Park Service for our decades-long commitment to preserving and beautifying our National Parks. CSAA Insurance Group has a long tradition of helping people. Beyond the products and services we offer, we’re committed to helping build healthier, safer, stronger communities. We believe our commitment to volunteerism is an integral part of what makes us a good corporate citizen, a great place to work and a company others want to work for. By volunteering, CSAA Insurance Group employees demonstrate our values, enhance our reputation, encourage organizational collaboration, deepen community engagement, develop leadership skills, maintain company morale, and have fun! Employees may take up to 24 hours of paid time off work each year to volunteer at nonprofit organizations. Employees trained by the American Red Cross as a certified disaster technician are eligible for 80 hours of paid time off if they are deployed. Our employees can also participate in the following grants programs: Dollars for Doers, Dollars for Board Service, and Matching Gifts.